In a new article in Research on Language and Social Interaction (ROLSI) I talk about how visual representations of acoustic data (pitch traces, waveforms, spectrograms etc.) have been prepared and used in ROLSI articles, trying to encourage researchers to think about their construction, purpose and use. For me, the main purposes are to provide corroborative evidence for the researcher’s claims, and to allow the reader to independently verify those claims. I’m interested in the ability of visual representations to efficiently convey relevant information. (Incidentally, anyone interested in beefing up their knowledge of phonetics, including reading spectrograms, should read Richard Ogden‘s wonderful An Introduction to English Phonetics.) One of the points that they make is that there is no break in voicing between “turkey” and “you know”. They are, as we would expect, exactly right in making this observation. You can listen to the whole call on Talkbank; the utterance in question is at line 133. We don’t normally have the luxury of listening to the data being discussed, and instead have to rely on the visual representations provided by the researchers to verify their claims. As a phonetician when I’m looking for evidence of the continuation of voicing (vibrations of the vocal folds) I look for two main things: periodicity (a repeating pattern) in a waveform, and striations (vertical lines) in a spectrogram. In the case of this particular join I would be looking at a display something like this, listening to the join as I looked (click on the image to see the full size version). 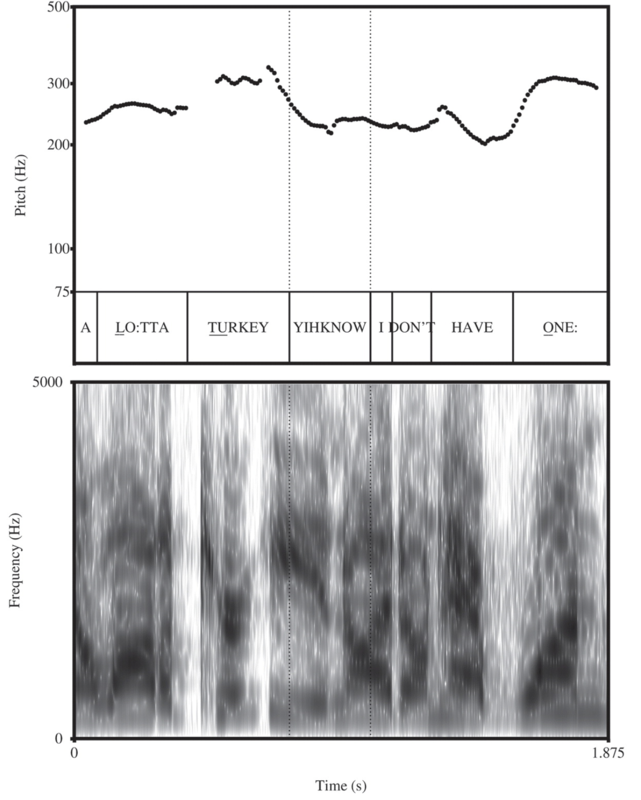 From this display of a portion of the same data (“key yih” of “turkey yihknow”) it’s clear that the waveform across the join is periodic, and that there are striations in the spectrogram. All great evidence to support the original claim of continued voicing across the join. But this is not so obvious from the visual representation in the original article: there is no waveform, and the spectrogram presents so much information discrete striations can’t be identified. I’ll finish with one last point which might provoke a bit of thought concerning visual representations. Let’s assume, for the sake of argument, that Leonardo da Vinci’s Mona Lisa is an accurate likeness of Lisa Gherardini. If we could travel back to when and where she lived, we would expect to be able to identify her from that visual representation. On the other hand, if what we had to go on was this charming line drawing by Melissa we surely wouldn’t stand a chance. The point is not that all visual representations of acoustic data should be as detailed as possible, but that the nature of the visual representation we are given has a significant impact on its usefulness to end-users. And with that we are back to thinking about the purpose of visual representations: in the case of visual representations of acoustic data in ROLSI, to provide corroborative evidence for the researcher’s claims, and to allow the reader to independently verify them. This article was first published in the Research on Language and Social Interaction Blog. Click here to read the original post.